Technically speaking, we should have begun our Seders much later than we did. We really should have begun at about 7pm instead of our 5:30 start time. I had a very important reason for starting early, though: My boys. To me, the most important part of the Seder is passing on our religious, cultural, and family traditions to the next generation. Unfortunately, "the next generation" tends to get tired and cranky if they stay up too late or if their dinner is delayed too much. 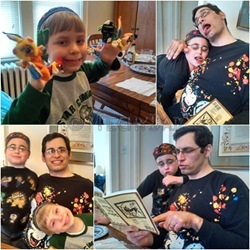 So while we COULD have begun the Seder late and eaten even later, it would have meant that the kids wouldn’t have been a part of it. Instead, we bent the rules. Thanks to this, the boys got to follow along, participate, and even have a bit of fun. NHL got to read. JSL got to sing (with NHL singing the words first since he’s the better reader). We even got a little silly. In short, we made some wonderful memories and perhaps even formed some new traditions. How do you form new family traditions this time of year?